DHS's Customs and Border Protection agency apprehended 365,000 foreigners just inside the Mexico-US border in FY12, over 1,000 a day, down from the peak 1.6 million in FY00 or 4,400 a day. There are over 18,000 Border Patrol agents on the Mexico-US border, and they have 260 aircraft to help them patrol the 2,000-mile border. 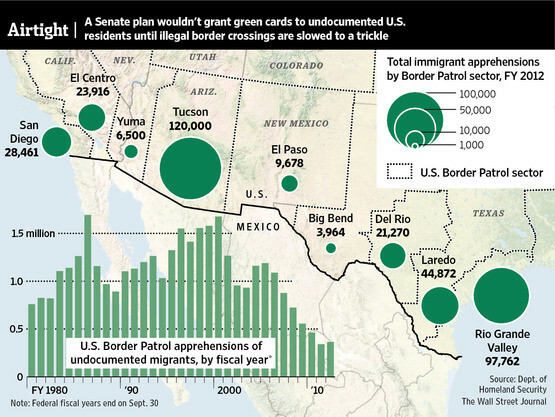 Under the Senate Gang of Eight comprehensive immigration reform plan released in April 2013, DHS would have 10 years to place the entire Mexico-US border under surveillance and apprehend 90 percent of those who cross the border illegally. After the border is deemed "secure," most of those who obtain a probationary legal status could apply for regular immigrant visas. Unauthorized farm workers could become regular immigrants sooner by continuing to do farm work after receiving Blue Card probationary legal status.